We recommend that you stay at least one night in Calgary prior to picking up your motorhome so you are rested before beginning your drive. It’s a beautiful city with lots to do. It’s another world today as you explore the Alberta Badlands and the world of the dinosaur. Travel south today, stopping in the town of Okotoks, with its typical Canadian Main Street, small businesses and restaurants. The next small town you will come to is High River with its historic Railway Station and western style buildings. Waterton Lakes National Park has a variety of activities you can enjoy year round. Enjoy breathtaking scenery, vast hiking trails and the peaceful serenity of the park. Leave Waterton today and travel to Cardston to visit the Remington Carriage Museum before ending up in Kananaskis. Take some time to stroll through Kananaskis Village, beautiful at any time of year. Spend more time in Kananaskis before traveling back to Calgary. If you’d like to continue exploring the Rocky Mountains, we suggest checking out our tours that take you through Banff. 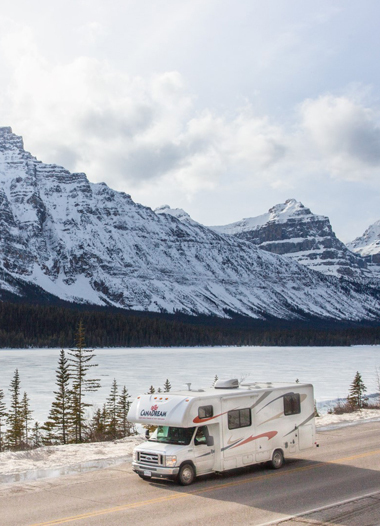 We recommend that you stay at least one night in Calgary prior to picking up your motorhome so you are rested before beginning your drive. It’s a beautiful city with lots to do. Visit Stephens Avenue downtown, stop in at the Calgary Tower and hang out at Olympic Plaza. Also worth a visit is the Glenbow Museum and Princes Island Park. Outside of the downtown area be sure to include Heritage Park and Fort Calgary, the Calgary Zoo and 17th Ave.
As you travel north east from Calgary towards Drumheller, the rich, rolling farmlands suddenly break away to reveal an astonishing, twisting, turning canyon, walled with multi-coloured layers of sandstone, mudstone and coal alternating with shale sequences. Plan to spend a few hours visiting the Royal Tyrell Museum, a world-class facility dedicated to the study of Drumheller’s early residents, the dinosaurs. Visitors to the museum can explore hundreds of preserved fossils and take part in interactive displays and exhibits. It’s also worth a trip to Horseshoe and Horsethief Canyons, Badlands Historical Center and the World’s Largest Dinosaur. The Dinosaur Trail RV Resort, located 11 km west of Drumheller in a quiet rural setting on the banks of the Red Deer River, is a good choice for a campground here. Check your CanaDream app to receive discounts available to CanaDream Guests. Explore the area east of High River and search out the towns of Millarville (famous for its farmers market held on Saturdays throughout the summer), Turner Valley (it was here, in 1914, that Canada's first major crude-oil discovery was made), Blackie, and Black Diamond. These towns are all part of Diamond Valley – the Heart of the Cowboy Trail. Continue south on Highway 6 to Waterton Lakes National Park, full of charm and natural mountain splendour. We recommend you spend at least two nights here exploring the area. Waterton Lakes National Park has a variety of activities you can enjoy year round. Immerse yourself in the peaceful serenity of the park in the winter and take in some cross country skiing, snow shoeing, or just a stroll in the snow. Hiking trails are open year-round, offering a unique experience, breathtaking scenery, and a variety of flora and fauna. You can fish at the most beautiful alpine lakes the Rocky Mountains have to offer. If you're visiting Waterton Lakes National Park between June and September, consider taking a trip over the border into Montana. Glacier National Park, Montana, has a beautiful scenic drive called the "Going to the Sun Road". The Chief Mountain border crossing usually opens on June 1st and is the easiest way to cross between Waterton and Glacier National Parks. Leave Waterton today and travel to Cardston to visit the Remington Carriage Museum before ending up in Kananaskis. This museum has the largest collection of horse-drawn vehicles in North America, with over 240 carriages, wagons and sleighs. Your next town is Fort MacLeod, just 18 km west of it is world famous Head Smashed In Buffalo Jump – a UNESCO World Heritage Site and one of the oldest buffalo hunt sites of the native Albertan (Blackfoot First Nation) people. After visiting here, travel north along Highway 22 through the foothills of the Rocky Mountains until just south of Longview and the Bar U Ranch, one of the oldest ranches in Alberta. From Longview, it’s a breathtaking journey into the Kananaskis Valley as you leave the flatlands and arrive in the mountains. Take some time to stroll through Kananaskis Village, beautiful at any time of year. Hiking in Kananaskis is incredible, for hikers of all ages and abilities. A short hike that is appropriate for the whole family is Troll Falls. From the parking lot at Nakiska, this hike is at most an hour long and hikers are rewarded with a beautiful waterfall at the end of the trail. Close by Kananaskis Village is the popular recreation area of Ribbon Creek – each season here brings its own beauty and excitement. Many walking trails branch off from the car park and it’s worth taking some time to explore. Spend more time in Kananaskis before traveling back to Calgary. If you’d like to continue exploring the Rocky Mountains, we suggest checking out our tours that take you through Banff. Suggested places to visit are the Upper and Lower Kananaskis Lakes where you can take short hikes, watch the bird and wildlife and, depending on the time of year, the plant life. Heading back into Calgary, you can drop your RV off at our Calgary location or spend another night at Calgary West Campground on the western edge of the city close to Canada Olympic Park. Your CanaDream app will offer you a discount with your stay here.